On any given day during the winter, you will find soup being served here for dinner. We are a devoted "soup" family. We look forward to cooler weather just so that we can have soup. The movie, "The Tale of Despereaux", has a banner in it "Long Live Soup!" and I couldn't agreed more. I love the comfort that you find in a warm steaming bowl of soup. I love that it is one of the easiest meals to share because very rarely do you eat the whole batch in one sitting. I love the smell of it that drifts through the house when you step out. The soup of the day today was Beef Mushroom Barley Soup and it was scrumptious! I modified the recipe that I got from the Food Network Kitchens so I feel completely comfortable telling you the recipe. Heat a large soup pot or Dutch oven over medium-high heat; add 2 tablespoons of the oil. Season the meat generously with salt and pepper. Sear the meat on all sides until browned; this will take about 10 minutes. Set the meat aside and wipe the pan with a paper towel; you should have quite a bit of juice from the meat so you might want to pour that out and then wipe the pot. 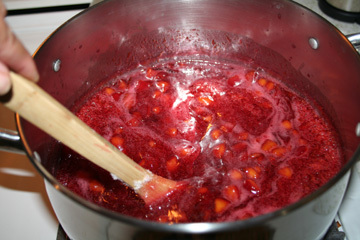 Lower the heat to medium, add the remaining 1 teaspoon to the pot. Add the carrot, onion, and celery to the pan and saute until tender, about 10 minutes. Return the meat to the pan with the stock, water and wine. Bring to a boil, adjust the heat to maintain a gentle simmer, cover and cook for 45 minutes until the meat is cooked through. Meanwhile, in a medium saute pan, heat the butter over medium-high heat, add the mushrooms and saute until golden about 10 minutes. Season the mushrooms with salt and pepper and add them to the soup along with the thyme, barley and tomato, continue to cook covered for another 30-45 minutes or until you see the barley plump. Note: May need to add more broth/water to the left-overs because the barley can absorb it. Every year it is my tradition to make a pecan twist for family or friends as Christmas gifts. I like to switch it up and pick which group will get it this way neither group gets too bored with receiving the same thing year in and year out. This year, due to some health issues, I am only able to make it for my immediate "new" neighbors. Most of them are small families, so I took the regular batch of bread dough and cut it in half to make smaller twists. All of the twists turned out so cute and fit perfectly on a nice luncheon plate that I had gotten half off. Each twist is topped with a brown butter icing except the one I let my Dad take home today after dropping me off. I might be able to squeeze one more out for our Christmas morning breakfast but I am not putting so much pressure on myself to make it happen this year. It might be a good year to have a little Matzo Brie instead. A couple of weeks ago, a few homeschool Moms and I decided to have a casserole/soup exchange. Each of us would make 5 entrees and swap at a designated spot on a designated day. The day will arrive tomorrow so that meant I needed to get cookin' today. I actually couldn't wait. I love to cook for other people. As usual, I picked a recipe that I hadn't made before... but one I had been eyeing for quite some time. 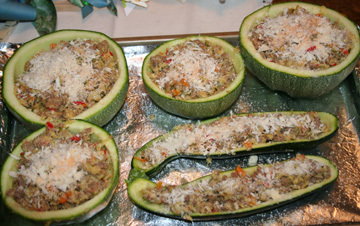 The recipe was from "From Our House to Yours" Comfort Food to Give and Share. The cookbook was created to benefit Meals on Wheels in San Francisco. I have found some delicious recipes in it and I believe that this one is just as tasty as the others. I needed to adapt the recipe to ingredients that I could easily find in this area - all but one was found so that one was left out. There isn't anything like making sauce from scratch...it is one of my all time joys in cooking. The smell filled the house. 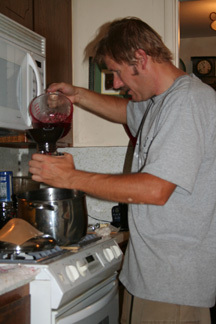 This one contained red wine in it and it would "intoxicate" your senses as you walked through the kitchen. I ended up making 3 pots of sauce. It had pork sausage and lean hamburger in it along with various veggies and herbs. nor how big the lasagna would be by the time I had finished BUILDING it. I had 32 pounds of lasagna casserole on my hands. That was just between 4 of them! That wasn't including the one I got to keep (and ate for dinner tonight). It was a wonderful day filled with anticipation of sharing a little bit of what I love to do with others. Yeehaw! to sharing with others! When Hot Rocks cooks he is always intense. You can really screw up his concoctions if you interrupt him when he cooks. I have never seem him relaxed while cooking....seriously. It is an art form to him - he is like his Dad in that respect. Last night was no different. 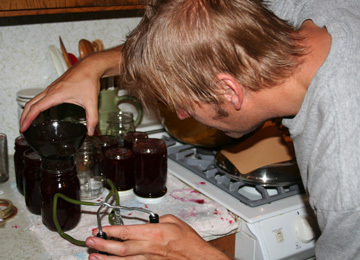 He made up his own jam flavors; used whatever fruit was in the fridge and stepped into his own private world. 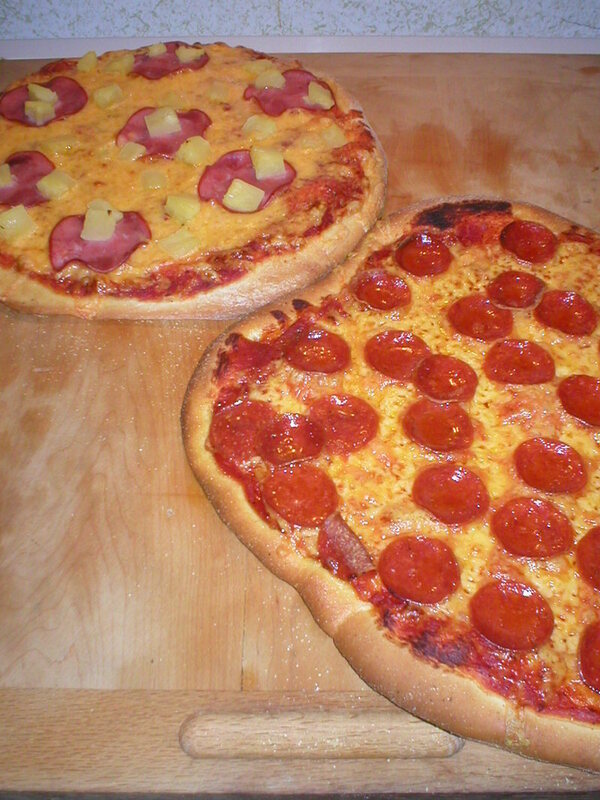 We cook completely different ,he and I, but that isn't unusual, we are COMPLETELY different. I saw this plaque one time, "We are a match made in heaven, just like thunder and lightning." and we live this out daily. He throws things together and not only is flavor important but presentation is just as important. I don't hunt out in our garden for the perfect herb toppings...he does. 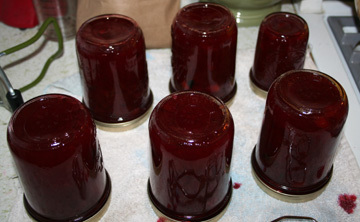 Or what about this.... getting down to jam level and making sure that it is perfectly put in the jar. Yes lovelies, this to me screams a man of perfection. Let me tell you everyone in the family LOVES when he cooks and especially me, because it is one less thing that I have to think about. I love this guy...he makes my world so much sweeter! That should hold us over for the winter. LOL! We went up to Toti's last week and picked her plum tree clean, knowing that they would just fall to the ground if we didn't. The tree was still chuck full of plums. We could only reach so high, even with the ladders. We ended up with about 4 flats that looked like this. 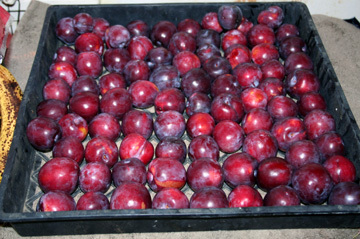 When you pick the plums they have this grey-ish gritty covering on them. We soaked them and rubbed them clean before cooking them. I really enjoy jamming when I am not trying to "squeeze" it into the schedule. 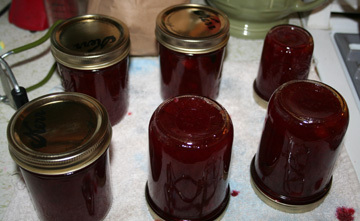 I didn't squeeze it this year so getting hot and sweaty over the stove didn't irritate me. You stand over the heat for at least a good 1/2 hour by the time you are done. 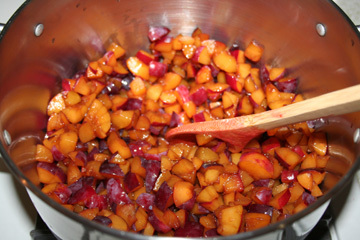 You bring the cut up plums to a boil. 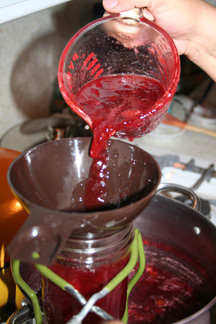 Yes, it really happens because there is about 1/2 c of water in the pot with the plums. Next, you cover them and let them simmer for about 5 minutes. This makes them nice and soft. 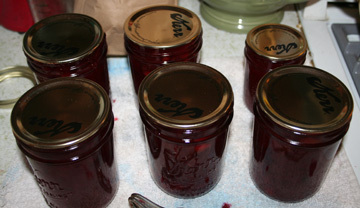 I like to add a dollop of butter - the pectin recipe thing says a 1/2 teaspoon but mine is a good ole' fashion dollop! 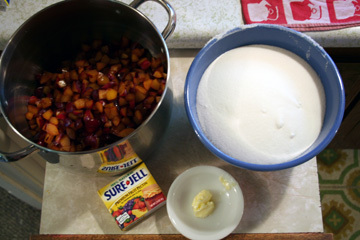 Along with the butter, I stir in the pectin and keep stirrin' that messy mixture until it comes to a rolling boil. All you super cookers, know what that is but each year I need to re-read my recipe to remind myself that that is a boil that doesn't stop when I stir it. Once my mess is boiling, I add that beautiful bowl of sugar. I love the color that it brings out. Talk about sugar-coated sweetness - yeah baby, that is what I'm talkin' about! This is the part that you really become a "Hot Mess" , you need to stir until the mixture comes to a rolling boil again and then an additional minute. 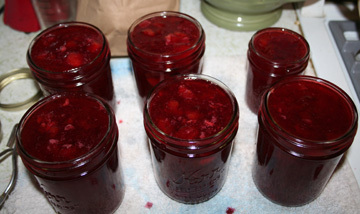 Once that is done, you get to pour that beautiful sweetness into jars. I added a couple of things to my canning equipment. I got those cool little green-handled grabbers at a barn sale. Boy, does that save my hands from burnin' up and Hot Rocks picked up that brown canning funnel. Talk about SQUEAKY CLEAN rims - Love it! So you fill the jars up. Put the warmed up lids on them. I wipe them dry on top before I put the twisty thing on them. Put the twisty thing on them. Twist them on. Then flip them - this seals them. This was a first for me and all I could think of was "grab the camera and document this!" After three flats of plums and I don't know how many hours....this is what you can have too! 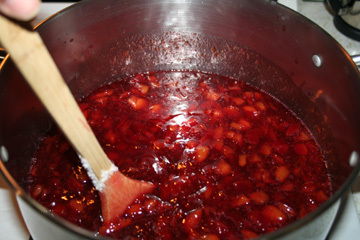 We will have more though, Hot Rocks is making his special Cranberry Plum jam. I don't do well without recipes, but he on the other hand is "WOW!" He has called all over the East County looking for cranberries, fresh or frozen, and he finally found them at Whole Paycheck..oops, I mean Whole Foods. 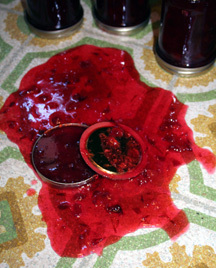 He was happy, I was happy because that makes for an excellent jam that only goes to the "super special" people. LOL! 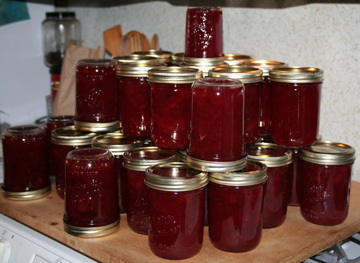 It's time to help for another batch of jam so until next time! 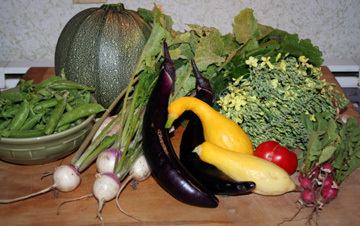 Looked at what we picked from our home garden today! Yum, yum! We are having a veggie night tonight with a little rice. I LOVE grilled eggplant and fresh broccoli - to die for then throw in a side of artichokes and you have a yummy little dinner! you cook a little Italian sausage with ground turkey, some red & yellow bell peppers, fresh garlic, fresh onions, put a some Parmesan cheese on top and toss in the oven. Viola! Yummy to our tummies! which actually looks like my Dad's arm right now, but we won't go into that, then you do something like this! Food fight! 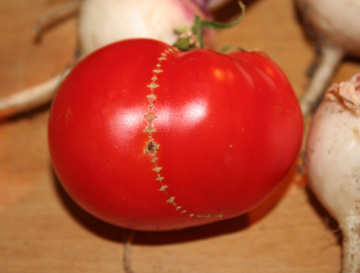 Farm Fresh is attacking the high-techie world. LOL Pook decided that everything needed a face on it, so we spent about an hour this morning staging this little fight scene, acquiring the proper artillery, and using washable markers on the food (so we didn't contaminate it). 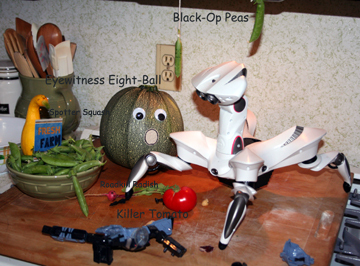 It doesn't look like much but we sure had fun playing with our food. 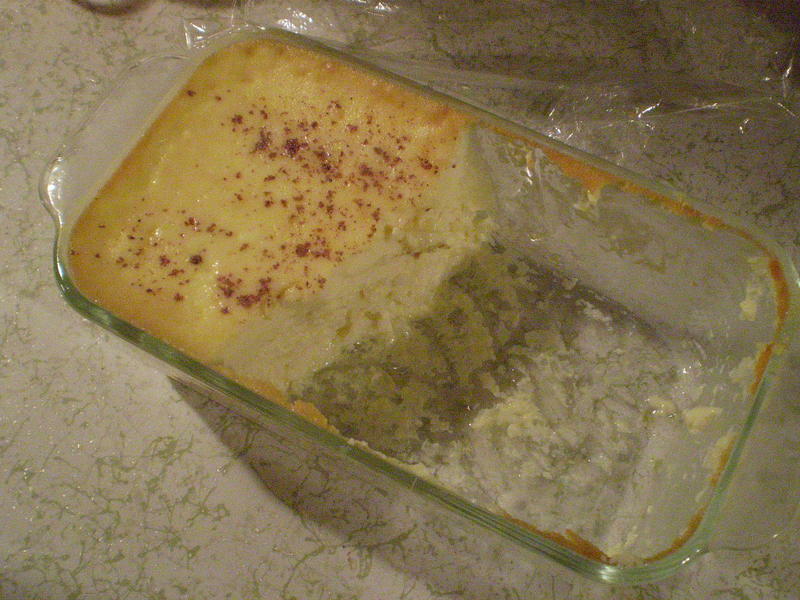 It is my Nana's recipe for Baked Custard. Did you notice how much of it was gone? Yep, that is how much I, alone, have eaten since last night when I made it. I can't keep my hands off of it. The weather turned cooler and my thoughts went to this dessert; so I pulled out my recipe that was on the back of a card that Nana had sent me. When I pulled it out of my recipe box, I started to well up with tears as I thought about her....I miss her very much. I had to postpone my celebration of Karrie's birthday because my daughter, Makayla, needed to take a little priority. (Karrie won't even notice because my Dad and step-mom are at her house right now - spending quality Karrie time). 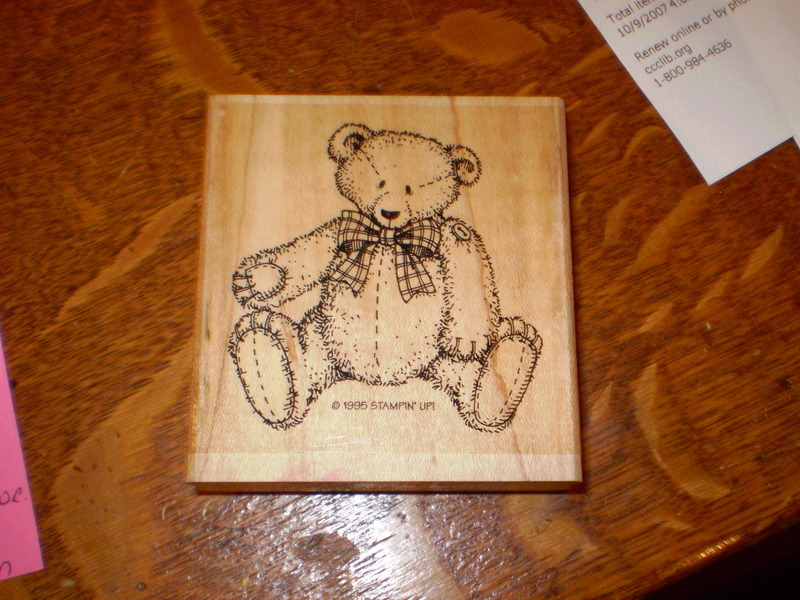 Do you remember this stamp from SU!? It is dated 1995 - it's an antique! Why do you ask? Well, I will tell you why...Makayla wants to have her birthday at Build-A-Bear so why not cut the little guy up so that you have to "build" him back again? 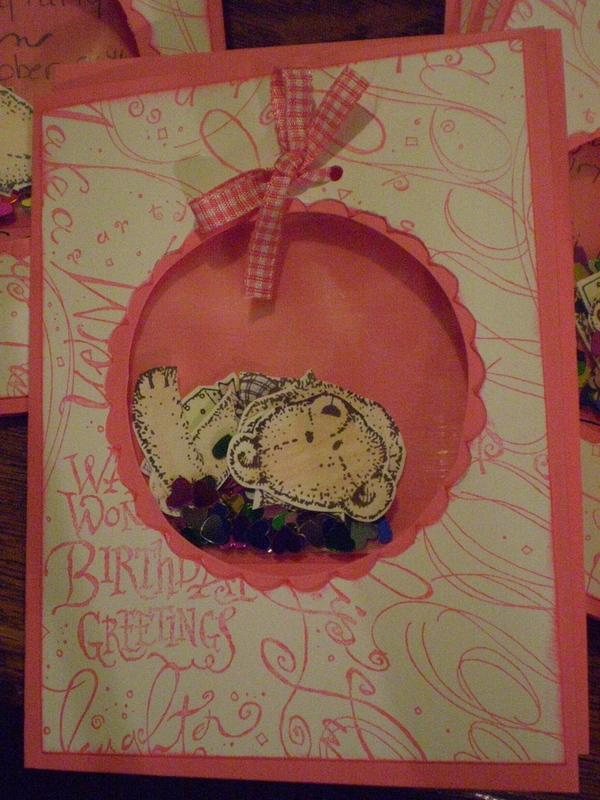 It has taken me 3 days with these invites - I had to cut the holes in the middle of the card because my punch didn't give me enough room to have it evenly spaced in the middle and I don't have the really cool cutter that Karrie and Dana have from Creative Memories (yes, I remember using that baby last stamp fest!!!) But that is OK, because M is soooo worth it! 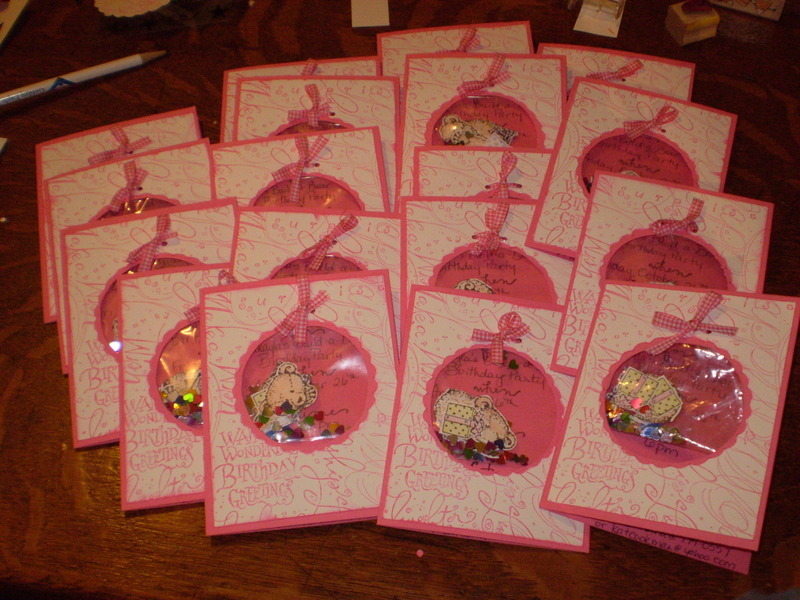 She would come in daily to check on the progress of the cards and today her comment was "Mom, those turned out really good. You did a great job." I love the kudos from my kids when I get them! 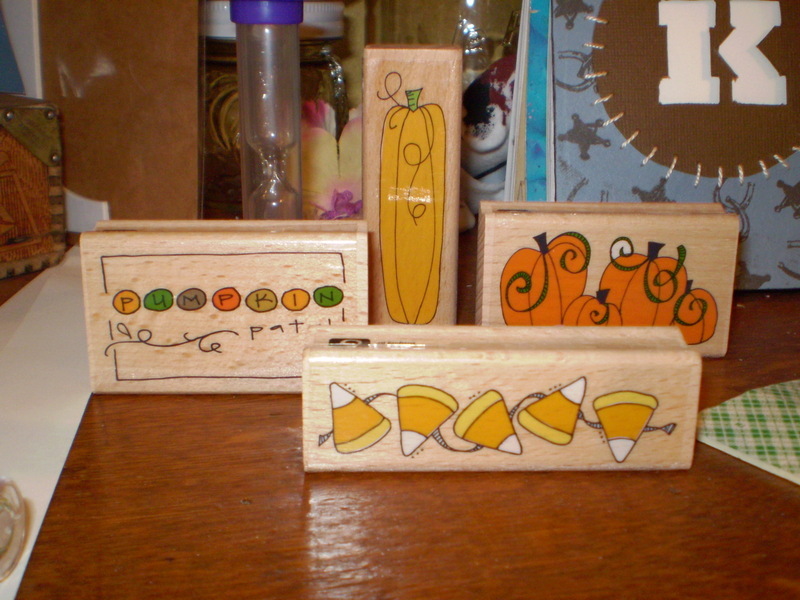 On a side note, I picked up these cute stamps at Michael's for $1 each - aren't they cute? I saw pumpkins and I NEEDED them. Thanks for stoppin' in for a peek - have a great night/day!